For our 2014 Youth Theme Introduction Activity (a joint/all-girls activity for our ward young women this year), we are doing 2 things: Playing YW (Family) Feud and making take-home wall hangings that go along with the theme. This post will describe the Family Feud game- I will have a separate post with the information about the wall-hanging soon (see the ‘youth theme’ label on the right side). 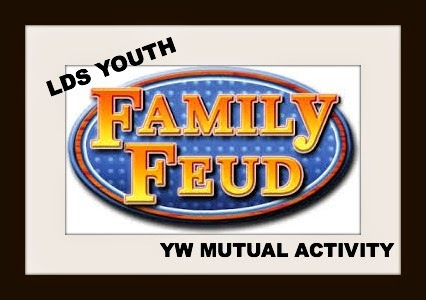 YW (FAMILY) FEUD:Since the purpose of this activity is to kick-off the 2014 Youth Theme (Come Unto Christ), this Family Feud style game is comprised only of questions related to the theme. You could use this same concept and change the “survey” questions to be used for any other themed activity as well.Hopefully you are familiar with the tv game show Family Feud- but your YW may not be. Teams (a family on the tv show) play together, taking turns making guesses about the most popular answers to real survey questions. For our YW version, girls will be grouped into 2 families (we have a small yw group) and then line up to take turns guessing. The host will have a sheet with the survey questions and the answers (see below) and (starting with one family) go down the line, giving each girl the chance to guess. Even correct answers may be ‘wrong’ if they are not one of the top answers listed. For example, for survey question #4, a yw might answer “coffee”, which is a correct answer, but is not one of the listed answers. So be sensitive about that and give praise for correct answers, but remind that correct answers may be listed (and points are only earned by guessing listed answers). If a YW can’t think of an answer (or her answer is not listed), move on to the next person. Each person only guesses once in a row, whether they are correct or not. If a team gets 3 incorrect answers, the question goes to the other team, who can consult together to come up with a single guess to win the total points for the question. In the tv show version, different answers can receive different point values. For simplicity, I’m just going to assign 1 point per listed answer. Continue rotating teams until you go through all 6 survey questions. To simplify, we are not going to have final (single-person) rounds or answer questions to see who gets control of the question. We will just take turns.I expect this game to take less than 1/2 hour because we have other things planned for the same activity, but feel free to make up more questions if you need the game to go longer.